Book our Top Truckee Vacation Homes Today! Imagine planning your stay in the peace and quiet of rugged mountaintops, rushing rivers, and serene lakes in an effort to escape the worries and stresses of everyday life, reconnecting with yourself and with nature. Lake Tahoe and its northwestern neighbor of Truckee are the perfect example of such a locale, where visitors flock year after year for the region’s picturesque beauty and wealth of activities. What kind of accommodations would you pick for such a trip? Well, the best way to experience this amazing locale is by staying in one of the classic Truckee vacation homes nearby, such as the lovely homes that we offer here for your vacation needs. Read on to learn more about the Truckee vacation home rentals that we offer! It may seem like a silly thing to think about when you’re in the midst of so much beauty, but having a nice place to stay can save you time, money, and hassle, as well as add to your vacation experience. A cramped hotel room wouldn’t afford you the justice of the full Truckee experience, and not everyone is cut out for roughing it in a tent. Fortunately, our Truckee Vacation Homes are precisely what the doctor ordered! Marrying the aesthetics of contemporary chic with a homey, rustic feel, our Truckee vacation home rentals serve as the perfect home away from home. Complete with a bevy of high-class amenities such as immense open floor plans, glittering arrays of windows that allow in plenty of cheerful natural light, resort-style bathrooms, spacious bedrooms and living areas, and custom-built features like gourmet kitchens and home theater rooms, you and your guests will not be disappointed by our vacation homes in Truckee. These Truckee, CA vacation homes also have the added benefit of being located mere minutes away from the best dining, entertainment, recreation, and attractions in the Lake Tahoe area. Lake Tahoe itself is just a twenty-minute drive away, and Lake Donner in Truckee is a sister lake where you can find all of the same activities as on Lake Tahoe. Tucked away less than 20 miles northwest of Lake Tahoe lays the small town of Truckee, a bustling vacation town that provides visitors with some of the most incredible sights and breathtaking views anywhere on the west coast! If you’re looking for something different for your next family vacation and the perfect spot to get away from it all, then Truckee is for you! And for the perfect place to stay while in Truckee there are no better options than Tahoe Signature Properties, as we are the premier rental property company in all of town! Why Should I Choose Tahoe Signature Properties? Good question! Here at Tahoe Signature Properties we believe that we are truly the premier rental company in all of Truckee for two reasons: our people, and our properties. When it comes to the people who work for Tahoe Signature Properties, you’ll find that we only employ world class staff to give you the best customer service experience possible. From our helpful rental team that will ensure that you and your family the rental property perfected suited to your needs, to our professional staff that ensure that each of our properties are expertly cleaned and maintained, you can rest easy knowing that our staff will ensure every second of your time with us goes as smoothly as possible. Additionally, our properties in Truckee are truly second to none. We offer a wide variety of different sizes, floorplans, and amenities to find the perfect match for you and your family’s needs! Looking for a 1 bedroom cabin for that romantic weekend getaway? You got it. Planning a big family reunion and need something huge for multiple families? No problem! At Tahoe Signature Properties, we have something for everybody. To give you an example, here is one of the phenomenal properties we offer in Truckee right now. Located in the beautiful Ponderosa Meadows community, you’ll feel right at home the second you cross the threshold into this gorgeous 3 bedroom home with room for up to eight guests. With an open and spacious floor plan, vaulted knotty pine ceilings, and a beautiful stone fireplace, you’ll be hard pressed to not want to take off your shoes and kick your feet up immediately! In addition to the home, the community surrounding the home itself is one of a kind. With a playground for kids, restaurants and bars within a three minute walk of the community, and Lake Tahoe just a short 20 minute drive away, you’ll truly have everything you need here! This is just a taste of what awaits you when you decide to partner with Tahoe Signature Properties for your next great vacation. So what are you waiting for? It’s the small moments that are the most memorable, and when you stay in one of our Truckee vacation homes, intimacy, family, and fun are interchangeable! Start your mornings with a cup of coffee on the porch, watching the sun rise over the mountains as you cuddle next to your life partner under a warm blanket. Quiet conversations, the sounds of the wind whispering through the trees, and that view—life doesn’t get much better than this. Oh, maybe you should add an angel food chocolate chip cookie from the Treat Box Bakery to this postcard perfect picture; now you’ve created paradise! After a breakfast that consists of the aforementioned cookie and maybe a slice of apple pie, it’s time to put on your hiking shoes and head for the hills, or at the very least, Northstar Resort. The trails here will take your breath away every season of the year, but in the fall when the leaves are turning and the summer where green is the signature color are two of our favorite times to explore. When hunger pangs strike, you’ll know that lunch time is near, so you’re not going to want to travel far. Jax at the Trax is a local favorite that serves American comfort food at reasonable prices; milkshakes, meatloaf, and merrymaking is on the menu at our favorite diner! Afternoons are the perfect time for souvenir shopping in downtown Truckee or taking a nap in your vacation rental, just because you can! As dinner time starts to roll around again, make sure you take a few moments to watch the best show in town: The sun setting over the glistening waters of Donner Lake is one performance you will never forget! Now it’s time for dinner, and although fancy can be fun, the simple food and drink found at the Old Town Tap is the only dinner that will suffice. Order a beer and a meatball pie and settle back for an evening of fun, food, and friends. You don’t have to worry about not knowing anyone in town; after one evening here, you’ll have a whole new pack of friends to miss when you’re gone! As the moon rises high over the mountains, it is time to head back to your Truckee cottage, condo, or home, and prepare for the next day’s adventures; life in Tahoe and Truckee gets better every day! 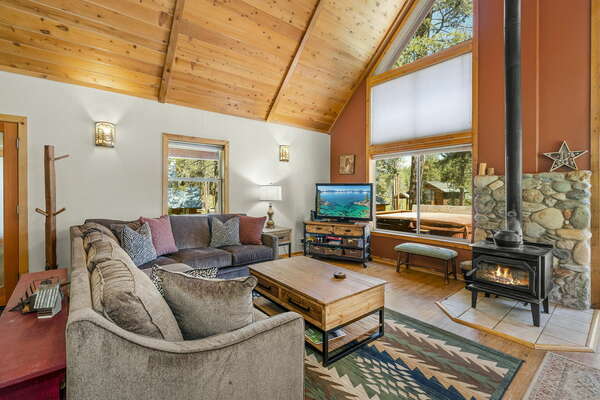 Experience the Best of Lake Tahoe with our Vacation Homes in Truckee! Contact our reservations team to begin planning the vacation of a lifetime in Truckee and the Lake Tahoe area when you choose Tahoe Signature Properties for your vacation accommodations today! For more information, contact us today and book your Truckee Vacation Homes! Call us at 1-530-562-4242; we can’t wait to hear from you!